The world looks different since I had cataract surgery. Brighter. Sharper. Cleaner. It’s as if I’d been looking through a very dirty windshield for a very long time, and someone came along and washed it clean. And oh, the colors! Deeper, richer, more lifelike. Just in time for arrival of Lady Spring, dancing across a carpet of wildflowers in a shimmering gown that grows greener every day. Without further ado, here is a sampling of my more colorful world. 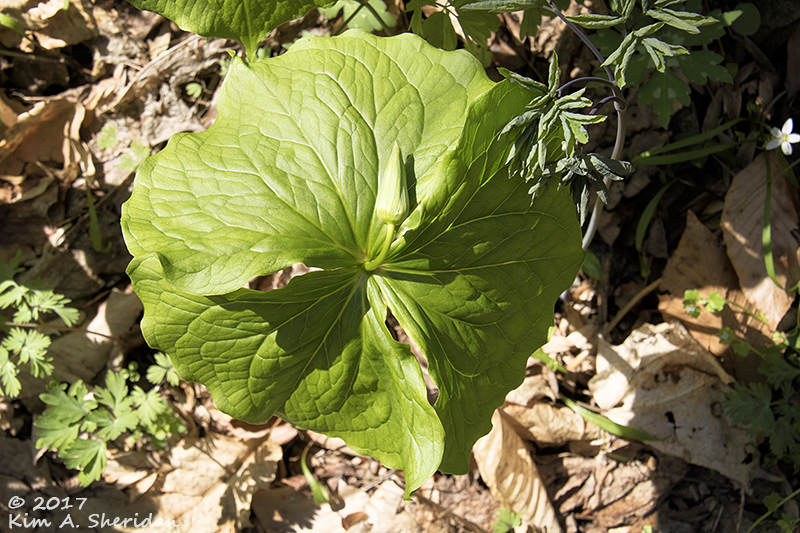 Looking down on the bud and three bracts (not leaves) of a trillium not yet in bloom. Her Ladyship’s accent colors may be subtle or showy, but she sure doesn’t skimp on the green. What color will this be when it blooms? Red? Pink? White? Yellow? Purple? 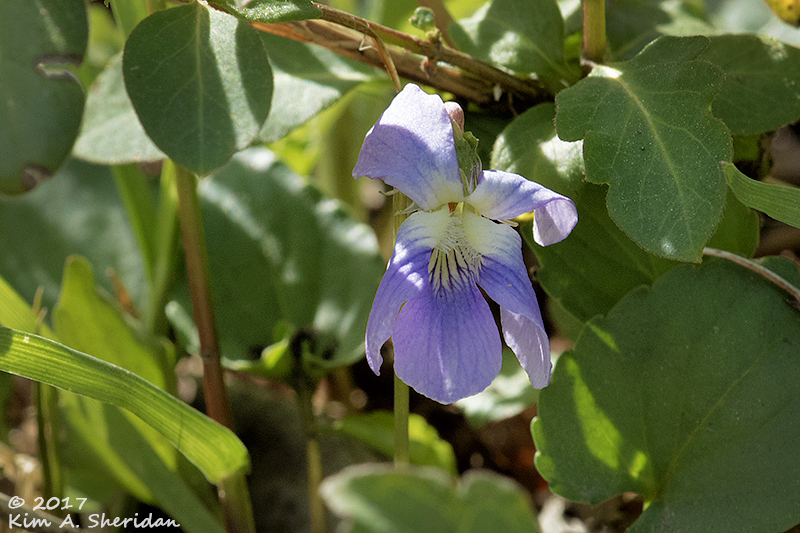 A violet. The name says it all. It’s not just seeing the obstacles. It’s the depth perception, a critical sense that had gone missing for some time. It’s been hard to accurately judge where to put my feet, and I have a small phobia about falling. This past weekend, we went to a nature preserve where the trail proved more challenging than we expected. 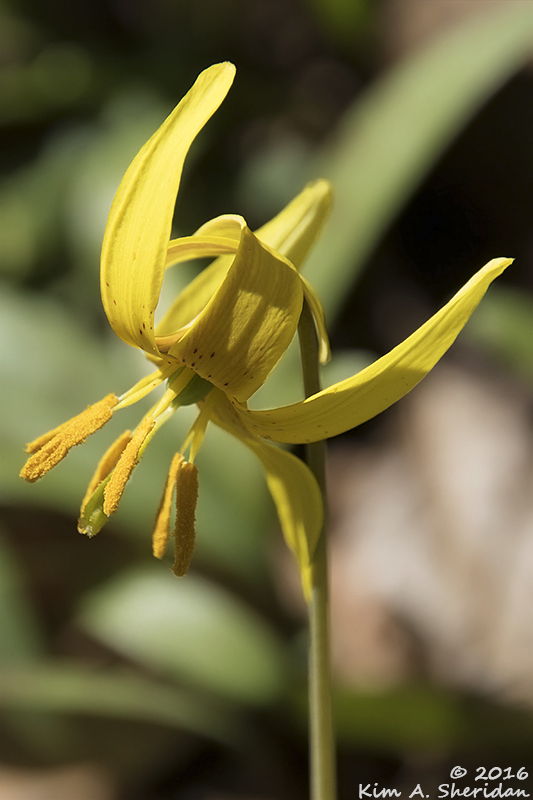 It was a narrow path that clung to the side of a steep ravine high above a creek. A thick layer of dry leaves hid the rocks and roots along the path, and made for a lot of slipping and sliding. Not long ago, I would have been very uncomfortable, and possibly would have even turned back. Not now. With more confidence in my vision, I really enjoyed this hike. I clambered up and down rock outcroppings like a mountain goat, and even made the numerous stream crossings easily. 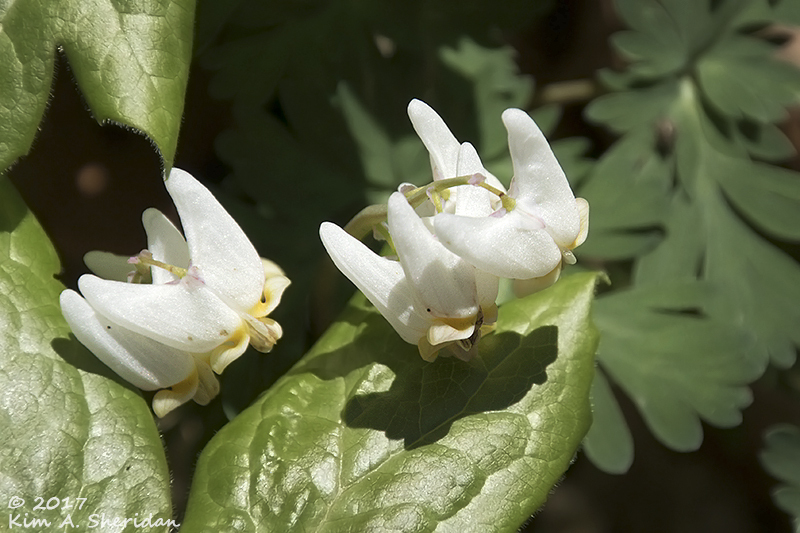 Dutchman’s breeches, one of our spring ephemerals, wildflowers that bloom in the brief time between when the snow melts and the trees leaf out. 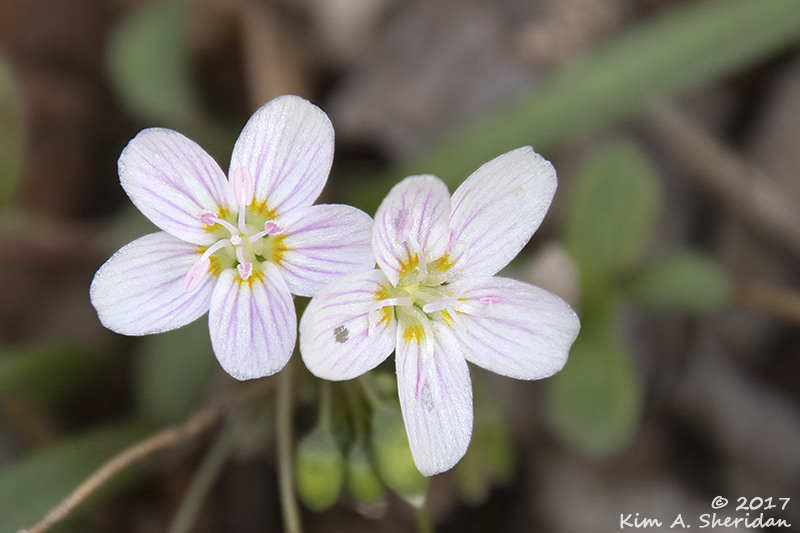 Spring ephemerals carpet the forest floor with small splashes of color. 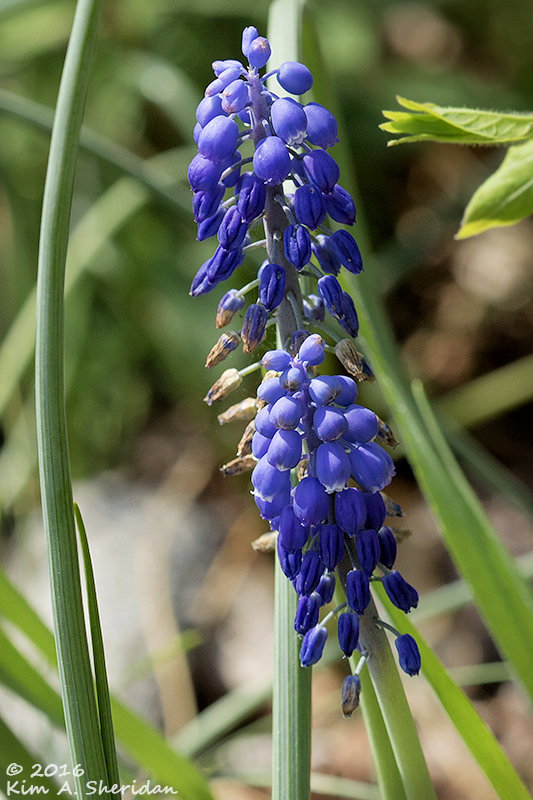 They have a short time in which to grow, feed, bloom and set seed for the next year. It seems Her Ladyship’s small footmen have hung their trousers out on the laundry line. The last few months I’ve been in a sort of creative funk. Winter is partially to blame for that, especially a winter of bare brown earth and trees. Not now. I find my enthusiasm for photography is awakening as the earth awakens. 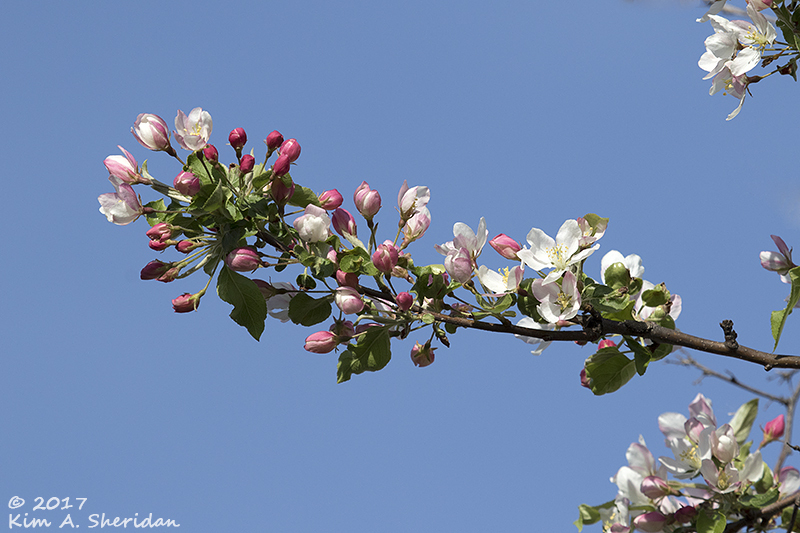 Lady Spring has arrived, and I can see her beauty! And here it is! 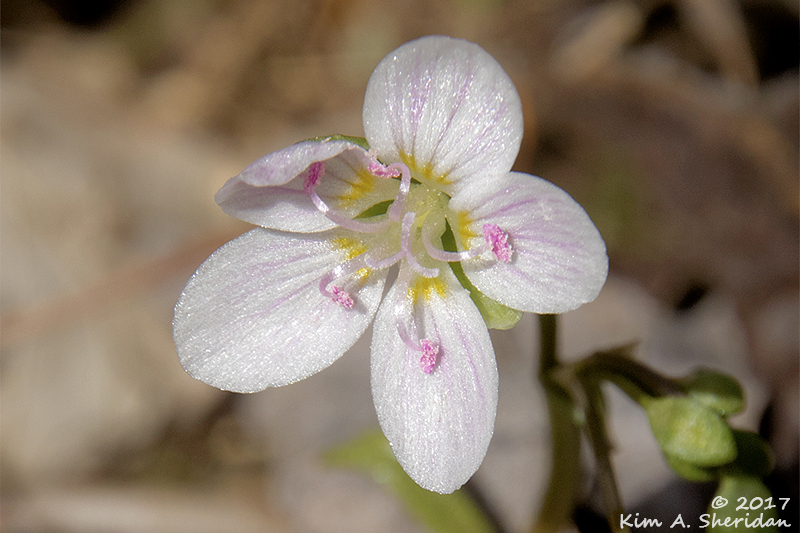 The aptly named spring beauty, one of our earliest wildflowers, pretty in pink. White is a color, too. My cataracts had turned black and white to dark gray and yellowish tan. For an amateur photographer, seeing true black and true white again is a joy. 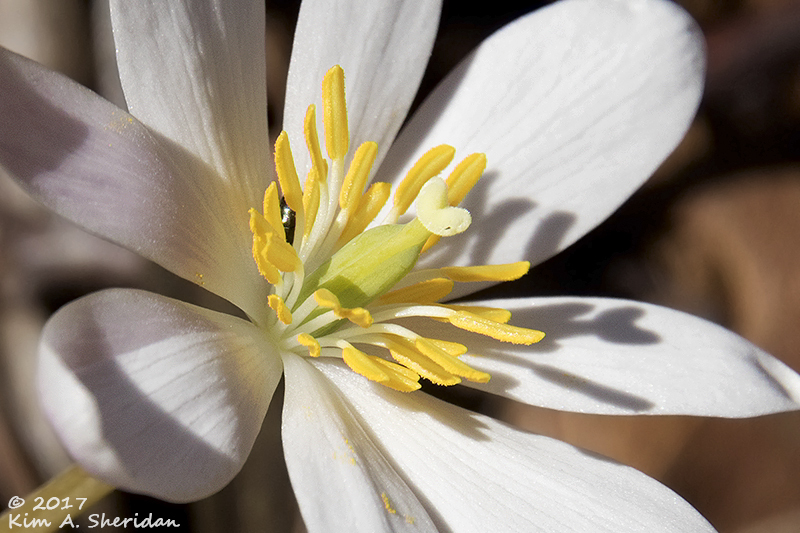 Especially when the white adorns one of Her Ladyship’s loveliest flowers. 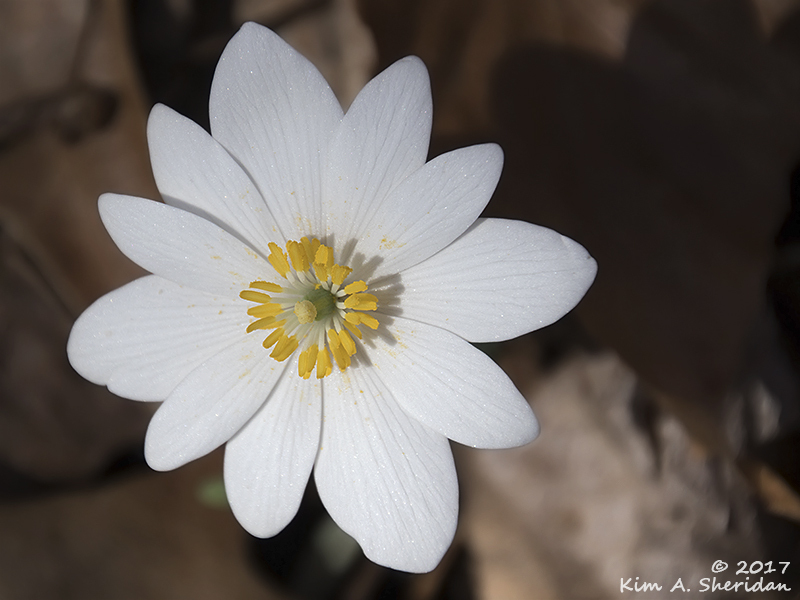 Bloodroot gets its name, not from the creamy white petals and bright golden stamens, but from the orange-red juice in its underground rhizomes. 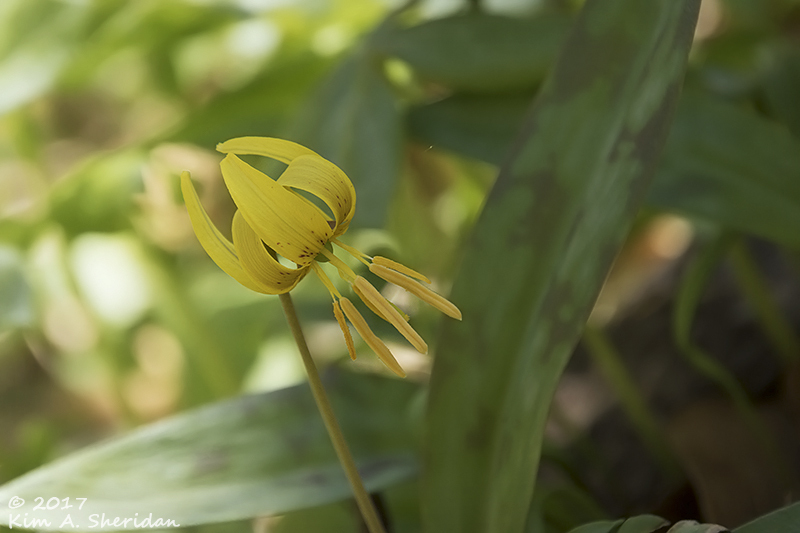 A trout lily nods in the shade of the forest floor. 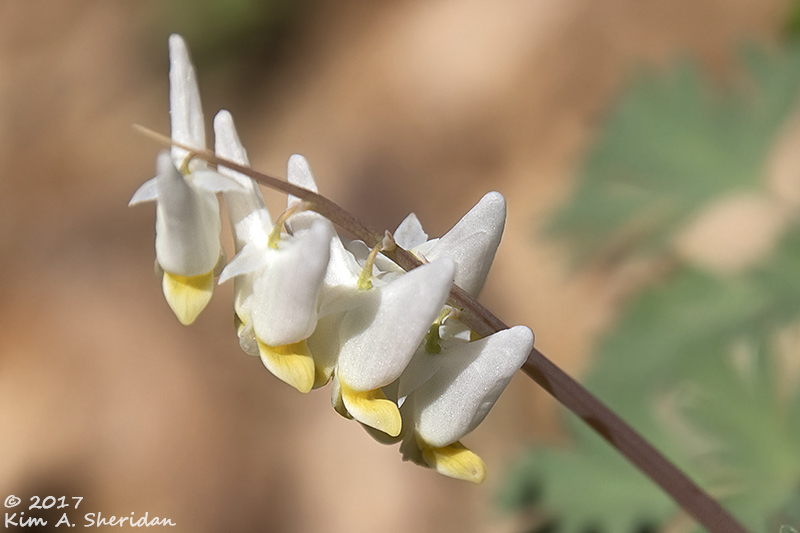 This entry was posted in Court of the Seasons, Flowers and tagged Bombay Hook NWR, Ferncliff Nature Preserve, Nature, Ridley Creek State Park, Wildflowers by Kim. Bookmark the permalink. Thank you! So glad you enjoyed it! 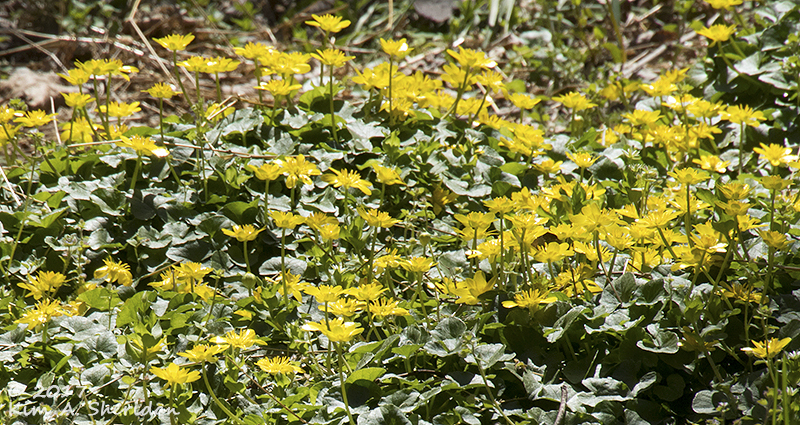 More flowers coming up… Don’t you just love Spring?